Want to play at an Online Casino using Paysafecard? Look no further! Royal Swipe offers you the best pay by Paysafecard Casino experience you will find! How, you wonder? Well, glad you asked! At Royal Swipe we like to welcome our new Paysafecard users with Welcome Bonus 100% up to $/£/€100 + 20 Free Spins on Shaman's Dream on your first deposit ! Why wait? 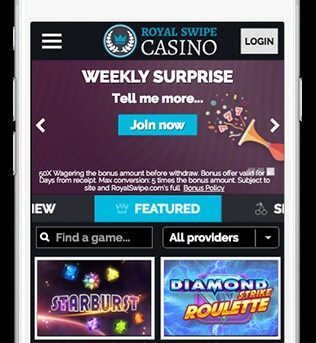 Royal Swipe Paysafecard Casino is safe and anonymous! What’s in the name! Paysafecard is the only deposit method that doesn’t require you to submit any information online. Just visit one of the 80.000 selling points near you and purchase a card. Use the code and your money will instantly transfer online! The big advantage of Paysafecard Casino play is that you can never spend more than you intended to. So no unwanted surprises afterwards! Your local Paysafecard shop is just minutes away and opens up an unique Online Casino experience! Dive in to a world with over 400 games, mobile scratch cards, casino games, jackpots and slot games! Never get bored due to our weekly promotions and profit every Tuesday; the more you play the more we pay! And don’t worry, you can play alot! Royal Swipe is accessible through all your devices! Whether you prefer playing on your desktop, laptop, iPad or smartphone: we adjusted the interface for every device! Entering is the most easy thing and rewards you by offering a Welcome Bonus 100% up to $/£/€100 + 20 Free Spins on Shaman's Dream on your first deposit you make! No codes needed, and immediately available! No subscription needed, no bills afterwards; just plain old fun with Paysafecard Casino! Sign up, it will only take 2 minutes and you can start playing all our titles with aWelcome Bonus 100% up to $/£/€100 + 20 Free Spins on Shaman's Dream right away!